CFA Society Italy contributes analysis and comment on issues related to ethics, professional standards, integrity of capital markets, and financial education. CFA Society Italy is pleased to introduce the latest articles and research published by our Members. CFA Society Italy , in collaboration with AdvisorPrivate and J.P. MORGAN Asset Management is pleased to present the "Etf & Fund Selection Guide." 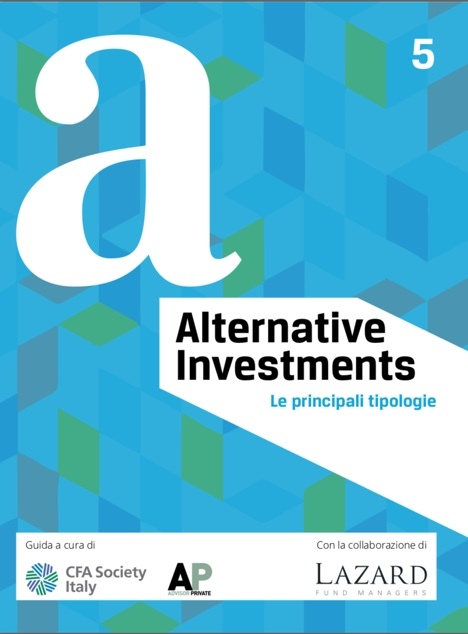 CFA Society Italy , in collaboration with AdvisorPrivate and LAZARD is pleased to present the "Alternative Investments Guide." CFA Society Italy is pleased to present the "BRRD Revisioni e Applicazioni." CFA Society Italy, in collaboration with AdvisorPrivate and AMUNDI, is pleased to present the ESG Investing Guide. CFA Society Italy, in collaboration with AdvisorPrivate and Jupiter, is pleased to present the Alternative Investing Guide. CFA Society Italy, in collaboration with AdvisorPrivate and JPMorgan, is pleased to present the Fixed Income Guide. CFA Society Italy, in collaboration with AdvisorPrivate and Invesco, is pleased to present the Factor Investing Guide. The views expressed in these articles and researches are those of the authors and do not represent the views of, and should not be attributed to, CFA Society Italy and CFA Institute. The content of these articles and researches does not constitute an offer to sell or a solicitation of an offer to buy any security that may be referenced on or through this material. Nor does this content constitute an offering or recommendation by CFA Society Italy of any security or advisory service. CFA Society Italy does not represent that the securities, products, or services discussed on, or accessible through, this material are suitable for any particular investor. Investors should consult a financial advisor for advice suited to their individual financial needs. CFA Society Italy cannot guarantee the accuracy or completeness of any statements or data contained on this material.